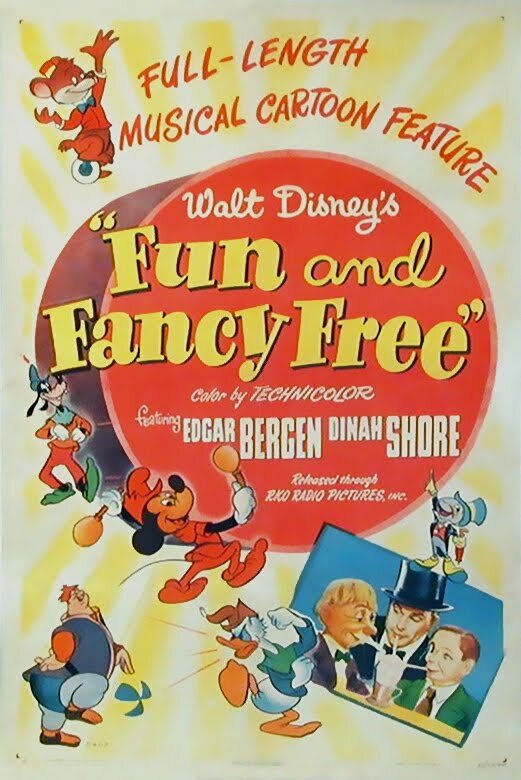 'Fun and Fancy Free' is very much a product of the poor shape that the Disney studio was in at the time. The war had cut into the profits of some very expensive films, causing them to not make money, and the government had used the studio for propaganda films, often paying Walt less than what the films cost to make. The studio couldn't afford to make a full feature film and instead, Walt decided to package shorts into feature length package features. Unlike the previous package features, 'Fun and Fancy Free' is comprised of just two shorts that have longer than usual run times. Jiminy Cricket from 'Pinocchio' plays host for this film and the title song was actually a song that was cut from 'Pinocchio.' Both shorts were originally conceived as feature films. 'Bongo,' about a unicycle riding circus bear, was originally conceived as a spin-off of 'Dumbo.' 'Mickey and the Beanstalk' had been in the story stage at the studio since 1940. The film relies on two big name stars to narrate the two segments. Dinah Shore, a popular singer, narrates 'Bongo.' She also sang "Two Silhouettes" in the previous package feature, 'Make Mine Music.' Ventriloquist Edgar Bergen and his two dummies, Charlie McCarthy and Mortimer Snerd, narrate 'Mickey and the Beanstalk' with some live action/animation combination scenes. The film opens with Jiminy Cricket riding a leaf like a canoe in what appears to be a lily pond as he sings "Fun and Fancy Free." We soon learn that the lily pond was actually an elaborate planter in a house. He hops to a book shelf and climbs down to find Cleo the goldfish in her bowl. No explanation is given as to why Jiminy and Cleo have left Geppetto's workshop, but oddly the cat in the house isn't Figaro. The cat chases Jiminy into a toy room, where he puts a record on called 'Bongo,' sung by Dinah Shore. The film transitions into the first story. Bongo the bear is the star of the circus with a specialty for unicycle riding. In fact, he is more at home on his unicycle than he is on his feet, but Bongo keeps dreaming of life outside of the circus in the wild. He escapes from the circus and is quickly shown around the forest by a group of adorable animals. But Bongo's first night in the forest doesn't go well and the next morning is rough, until he meets a pretty girl bear named Lulu Bell. Lockjaw, a big brute of a bear, also has his sites on Lulu Bell and when she slaps Bong, he thinks she has turned against him. She tries to slap him again, but accidentally slaps Lockjaw. It turns out that when bears are in love, they "Say it with a slap," so Lulu Bell is now stuck with Lockjaw. Bongo tries to steal Lulu Bell back by fighting Lockjaw. Against the odds, Bongo beats Lockjaw, slaps Lulu Bell, and they live happily ever after. As the film transitions back to Jiminy, the record has started to skip, so he stops it and hops up on a table where a party invitation is addressed to Luana Patten, the female child star from 'Song of the South.' It is from Charlie McCarthy, Mortimer Snerd, and Edgar Bergen. So Jiminy hops out the window and heads to the house across the street where Edgar Bergen lives. At the party, Bergen tells the story of 'Mickey and the Beanstalk' as it transitions into the second story. Mickey, Donald and Goofy live in Happy Valley as farmers, but all of the happiness disappears when the magic singing harp is stolen by a giant shadow. The three farmers are left in poverty and when Mickey goes out to sell their last cow, he comes home with magic beans instead of money. Donald throws the beans through a crack in the floor in a fit of anger, but during the night the beans grow into a giant beanstalk, carrying the house to the top while they sleep. Upon waking up, they find a dim giant who can transform into anything. It turns out that he is the one who stole the singing harp, so Mickey and the gang attempt to rescue her and get her back to Happy Valley. The giant catches them and chases them down the beanstalk, but they cut it down, causing him to fall to his doom. They return the harp and happiness is restored to Happy Valley. As Edgar Bergen finishes the story, Mortimer is beside himself about the giant's death. Bergen explains that the giant wasn't real, but then the giant rips the roof off and pokes his head in to ask if anybody has seen a mouse. The film ends with the giant roaming around Hollywood looking for Mickey. 'Fun and Fancy Free' succeeds in being fun, despite the awful title. The film has some instances of great animation and some excellent live action/animation combination scenes, but the bulk of the animation is of short quality, not feature quality. The real downfall of the film is 'Bongo.' It's a cute story and it has its moments, but the completely narrated format doesn't work for this long of a short. It would have been much better if the characters were allowed to speak for themselves with less narration in the same style as 'Mickey and the Beanstalk.' Mickey's portion of the film is the real highlight and it's about all you remember afterward. There is quite a bit of music in the film, but it is mostly unmemorable. Not surprisingly, none of the songs were nominated for an Academy Award. The bottom line is that if you are a fan of Mickey Mouse shorts, you are sure to enjoy 'Fun and Fancy Free' because 'Mickey and the Beanstalk' is one of the best shorts ever produced. This film is also monumental in Disney history because it was the last time that Walt Disney provided the voice for Mickey Mouse. Both 'Bongo' and 'Mickey and the Beanstalk' were edited and replayed on TV years later. In the TV version of 'Bongo,' Jiminy Cricket provided the narrative instead of Dinah Shore. 'Mickey and the Beanstalk' received bigger changes for its TV version. All of Edgar Bergen's live action scenes and narrative were replaced by Ludwig Von Drake and his ant, with Willie the Giant breaking the roof off of his house instead. 'Fun and Fancy Free' is currently available on DVD in its entirety. In addition, the Ludwig Von Drake version of 'Mickey and the Beanstalk' is available as part of the 'Walt Disney Animation Collection' paired with an assortment of other classic Disney shorts. The film is also available on iTunes.